Earlier this month, the Federal Election Commission released the first batch of financial disclosures for the 2016 candidates. 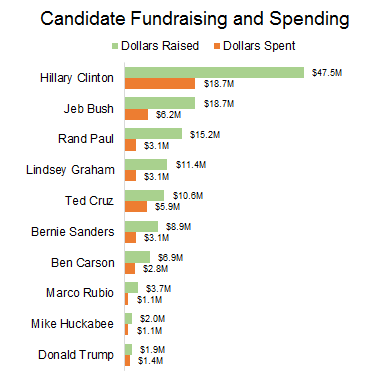 As usual, the fundraising figures have received a great deal of scrutiny: How much money did each candidate raise? And where did it come from? This post is about the other side of campaign finance: Where is all that money being spent? How many people are the campaigns hiring? The teams range in size from 10 people to over 300 people. Who is making use of technology? Some campaigns incorporate machine learning into their marketing. Others are content with direct mail. Some candidates are traveling in private jets and limos. Others are staying at Motel 6. $100,890 for a domain, $1,213 for grilled cheese, $68,920 worth of “musical entertainment” every campaign has a few standouts. The data covers only three months, April 1st through June 30th. But even at this early stage, it tells some very clear stories about who these candidates are and their strategies for winning the race. 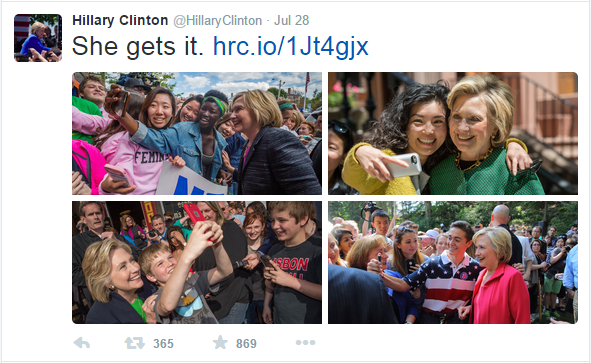 Hillary’s campaign paid $18,000 to Bitly, whose products include Branded Short Domains, such as the hrc.io domain seen in her tweets. Hillary is preparing to go big. At this early stage of the race, her expense report already lists 344 individuals on her payroll. For comparison, the next biggest team is Jeb’s with 58 people. And she looks to be making room to grow the team even more. The Campaign’s financials include “rent” payments for 26 different locations, including her new 80,000 square foot Brooklyn office. Hillary’s technology is leagues ahead of everyone else. I was genuinely impressed to see some of the tech companies her campaign is working with. Her expenses include payments to Github, Slack, Bitly, Optimizely, and even Kaggle, a website that hosts data science competitions. How can you not be impressed with a campaign that hires a dedicated data visualization analyst? I’m no campaign finance expert, but if the money came from the Clinton campaign, isn’t it the Clinton Campaign who paid for it? He spent a lot on media, mostly direct mail. Carson has spent $3M on media thus far. Of that amount, $1.9M went to two third-party direct mail firms: TMA Direct and Action Mailers Inc.
Carson has a thing for music. Like Carson, Cruz spent nearly all of his media dollars on direct mail. When it comes to travel the Cruz campaign does appear to favor new technology. 100% of their car service expenses were from Uber. It is the only campaign whose expenses include no traditional taxis. Cruz is spending big on strategy. $1,233 for grilled cheese from the Golden Grill Food Truck. Relative to the size of his staff, Jeb spent a lot on rent and equipment. Despite having a payroll of just 58 people, the campaign is paying $77k in monthly rent for a 30,000 square foot Miami office. Per person, that’s 517 square feet, more area than many Manhattan apartments. The campaign also spent $371k on “computer equipment,” which comes out to over $5,000 per person. The campaign financials only cover expenses that were made before June 30th, and Jeb only announced his candidacy on June 15th. So it seems likely these expenses reflect an operation that is still ramping up. A $3,889 bill from the ultra-luxury Mandarin Oriental Hotel in Miami. Based on the rest of his expenses, Jeb doesn’t appear to be splurging on personal luxuries, but it looks like he made an exception for his trip to Miami. Bernie is frugal with travel expenses, and pretty much everything else. His campaign regularly travels by Amtrak rather than by air, and their hotel choices are modest, as evidenced by a June stay in Motel 6. The Sanders campaign spent most of its money on media, mostly digital. Eight “computer equipment” purchases ranging from $129 to $460. My first thought was that the campaign must not place a high value on technology. But looking closer I think it’s just the opposite. Some of the equipment was bought at Crucial.com, a store that sells solid state drives and internal memory upgrades. The Campaign wouldn’t be shopping there unless they were doing some serious number crunching (or playing a lot of video games). Another interesting item from the fundraising side: the campaign received a donation of $822 worth of ice cream from Ben and Jerry. Paul has a clear focus on technology. His financials show payments to three different businesses for “data work.” All appear to specialize in data mining / machine learning for marketing purposes. The Campaign’s marketing strategy also looks to involve a wide range of digital media types, some of it outsourced and some purchased in-house. And Paul even accepts bitcoin donations on his website. His purchase of randpaul.com for a whopping $100,890. The domain was purchased by his senatorial reelection committee just before he officially announced he presidential bid. Rubio spent his media dollars on direct mail. The only mailing list appearing in his expense report is one he purchased from the Republican Party of Iowa. Rubio’s staff has strong ties in Iowa, including his senior political advisor Heath Thompson, who helped elect Iowan Jodi Ernst to the Senate. As of last Sunday, Rubio was #8 in the Iowa polls. So whether or not he was focused on Iowa before, chances are he is now looking elsewhere. $654,439 paid to Campaign Solutions and $101,865 paid to Mustard Seed for “revenue shares.” Presumably he is paying these companies commission to help him with fundraising. For someone in the world of campaign finance, this kind of arrangement is probably pretty standard. But to me, that sounds like an awfully big chunk of whatever amount they helped him raise. His total fundraising for the quarter, from all sources, was $8.9M. The lesson for future Rubio donors: Donate to the campaign directly, or a chunk of your money may get taken off the top. The Graham Campaign is doing a lot of strategizing. A lot of sub-ten-dollar items that other candidates wouldn’t have bothered expensing, such as: $1.29 spent at Sam’s Club, $2.14 spend in a key copying machine, and $3.79 spent at Burger King. Mike Huckabee spends a lot on social media. His Facebook page has 1.8M likes, 600k more than Hillary’s. Mike is focused on social media. The Huckabee Campaign made monthly payments of $3,500 to oneQube, a company that offers a “social audience building & marketing” service. The Campaign also appears to be taking a very hands-on approach to its social media advertising. Since the middle of June, it has logged a $4,000 payment to Facebook on a near-daily basis. It looks like they gave Twitter Ads a try back in May, spending a few hundred dollars on four occasions. But the results must not have been great, since there are no Twitter expenses for June. He travels in limousines and private jets. In contrast to what Huckabee wrote in his book, only three of the ten candidates covered in this post appear to travel regularly via private jet: Donald Trump, Ben Carson, and Mike Huckabee. Consistent with his reported penchant for private flying, Huckabee’s expenses include 39 payments to 17 different aviation companies, for a total of $56,578 spent on private flights. The campaign has also made several payments to Carey Limousine International. Actually, that sounds like a pretty cool place to host an event. No aspect of Trump’s campaign is like any campaign I have ever seen. And his financials are no exception. It would not be a stretch to say they deserve their own blog post. Next Article How Many U.S. Cities Can You Fit Inside Tokyo? The only honest one is Bernie Sanders. Go Bernie! !